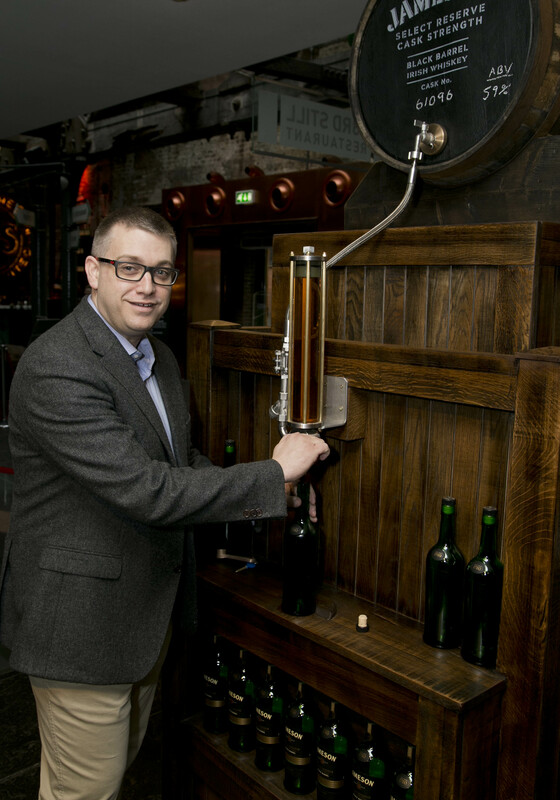 March 12th, Brian Nation, Master Distiller at The Midleton Distillery, marked the launch of new Jameson Bottle Your Own facilities at the Old Jameson Distillery, Dublin, by hand-filling a 70cl bottle of a new and rare Jameson Irish Whiskey. The new initiative, which is also launching at the Jameson Experience Midleton in Cork, invites whiskey fans to personally fill a bottle of Jameson Select Reserve Cask Strength Black Barrel from a live bourbon cask. Visitors can then personalise the label by hand with their name, the date and the whiskey’s cask number and ABV, before logging their personal details in a Bottle Your Own ledger, becoming a part of the Jameson legend. The newest member of the Jameson family, Select Reserve Black Barrel is a blend of rich, Single Pot Still Irish Whiskey and a rare small batch grain whiskey, which is triple distilled in small quantities just once per year. The expression is available at its natural cask strength for the first time and exclusively through the Bottle Your Own facilities at the Old Jameson Distillery, Dublin, and the Jameson Experience Midleton in Cork at the cost of €100 per 70cl. We were there on this cold, wet windy day, after a somewhat bumpy flight out of Edinburgh, (very grateful we visited duty free first) we touched down in Dublin and were met by the lovely Tony and taken to the Old Jameson Distillery. We met up with the guys from IDL and after taking in the, very impressive building, got our chance to try the bottle your own experience. Stewart being the perfect gentleman insisted I went first (as did I), after being told all about the cask and really feeling the excitement and enthusiasm, it was finally time for me to release the handle and fill the bottle. Due to a slight technical hitch the chamber just kept on refilling, meaning I had a well filled bottle, so much that we had to decant some in to glasses. Not exactly a hardship! I wimped out and let the wonderfully skilled operator put my label and seal on for me, once I hand filled in all the details on both the label and the ledger. 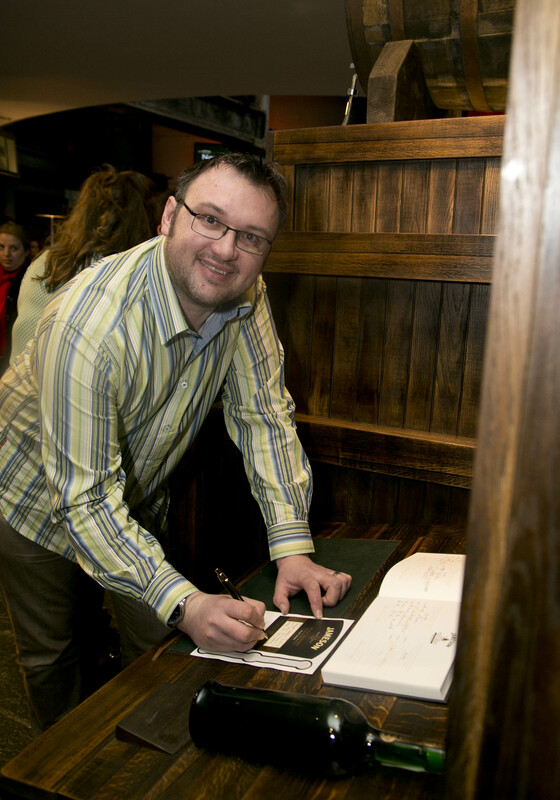 It was great to know that for all of history, I am bottle number 7 of the first ever fill your own cask, and that upon returning to the Old Jameson Distillery, that ledger will be available to see. Stewart was up next, and bottled number 8 like a pro! 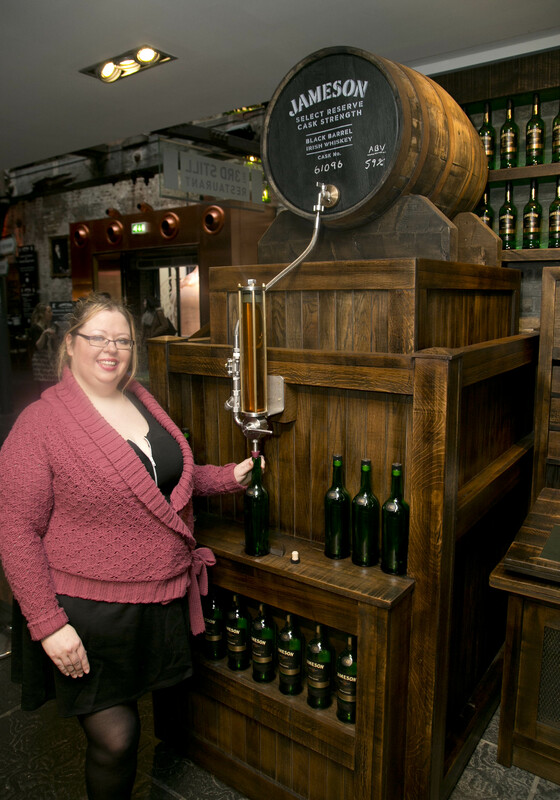 Jameson have positioned the cask in a great location and really made a feature of it, and it will be very popular indeed, the whole experience was fantastic, and I am sure the “live” casks won’t take long to replace. We then had a quick chat with Brian Nation, so keep your eyes peeled for the interview, before having a lovely lunch at the distillery, with the food being an absolute hit with everyone, it’s worth visiting for the food alone. Before taking in the tour, which was interesting and then checking out the extensive bar. I took in the cocktail range (look out for notes and recipes coming soon), as a well as a couple of exceptional drams. Not only is the bottle your own a truly wonderful experience, but the Old Distillery itself had so much to offer, this needs to be on your “whisky experiences before you die” list! With thanks to IDL for affording us such a remarkable experience and to Brian for taking time out of his incredibly busy day for a chat. Thanks to our lunch companions also, it was great to spend some time with Greg from Great Drams, Natasha and Christian too.